Does Lotto Rocket 649 PRO Really Work? Read Reviews! Lotto Rocket 649 Pro is supposed to be an intelligent lotto wheel generator program that uses historic statistical date of lottery results. It offers a combination of different number combinations for different lotteries. Lotto Rocket 649 PRO Exposed — How Much It Actually Costs? One of the things I will give Lotto Rocket 649 PRO credit for is the recommendation on their web site not to try not and change your lottery strategy with each new draw. Some people believe in quick pics. Some people play their favorite numbers weekly. Most people chose a particular lottery or lotteries to play regularly. Then, there are the mathematicians who believe in wheeling. That’s what Lotto Rocket 649 PRO software is. It’s a software program that uses wheels to play lotteries. Let’s look further. Lotto Rocket 649 Pro is supposed to be an intelligent lotto wheel generator program that uses historic statistical date of lottery results. It offers a combination of different number combinations for different lotteries. This also includes a Lottery Intelligent Random Generator. Wheeling is using past lottery results to predict numbers that are more likely to be chosen. There are different arguments on whether it actually works or not but most agree that this really only works if you buy more tickets. 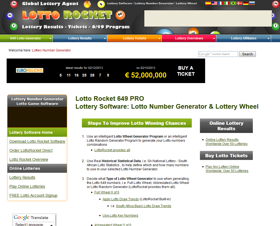 Looking further into Lotto Rocket 649 PRO, it seems that it only works for 6/49 lotteries with or without a bonus number. I’m not saying that there aren’t a lot of these internationally, but I do find it curious that this isn’t til a person gets quite a bit further down on their web page. The software design is juvenile with a messy banner and lots of places to click to play lotteries. It made me start to wonder whether they wanted players to play lotteries versus they wished to their software sold simply. One complaint that I have and probably anyone interested in purchasing this software would also express is the fact that they don’t say anywhere how much Lotto Rocket costs. They simple say go straight to download. Is Lotto Rocket 649 PRO Worth your Money? The answer apparently is “Absolutely nothing” – that’s what he said, and I couldn’t agree more. While I have bashed their lack of professionalism and outdated graphics, terrible presentation skills and application, I give Lotto Rocket 649 PRO a thumbs-up for fairness. They don’t require any upfront payment and offer their app for free, at least for a limited period so that prospective customers can put it to the test. I do doubt that many will turn into subscribers at the end of the trial period. Would you mind rating Lotto Rocket? Even if I was trying to market a product that I know for a fact couldn’t influence the chance to win a lottery, I think that I could do better. I got the feeling that Lotto Rocket 649 PRO doesn’t even try actually to sell their software. Maybe their wheeling and dealing to win is another game. These folks must be laughing all the way to the bank – hopefully not. The explanation on wheeling is about the only thing that is of value here. Hopefully, most people are smart enough to move on and not provide these folks with their big win – your money!